Cape Dory, the first album from husband-wife duo Tennis, told a whimsical story of sailing around the Atlantic Ocean. This story was sucked up and spat out by the blogosphere — retold, retweeted, reblogged, and criticized to the point of nearly destroying the band. After taking time to catch their breath (and obtaining the help of the Black Keys’ Patrick Carney as producer), the Denver-based group returns on Valentine’s Day with their new album, a much more aggressive, mature record called Young & Old. 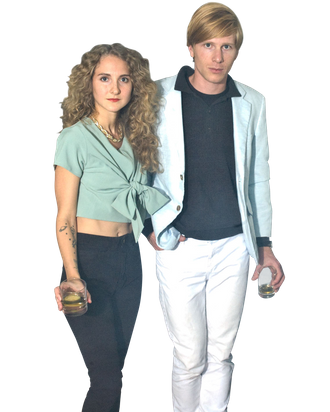 Vulture chatted with one half the band, Alaina Moore, as she and her husband Patrick Riley spent the day in the Rockies. Herewith, her thoughts on the new album, working with the dude she’s married to, and the backlash to the band. The story behind your first album, how you and Patrick sailed around the Atlantic Ocean together, has been so romanticized. What’s it like to have a little folklore about your band? Since you weren’t retelling your journey this time, what is Young & Old about? I decided to pick some themes that were extremely personal to me, that inspire me to write. I don’t know how to say this in a way that’s vague without sounding trite, [but] it’s actually about mortality, God, and human nature. I grew up in a very religious background, and now I am not religious at all. So going through the whole process of having this band occur out of nowhere, and getting caught up in this whirlwind, I had a lot, philosophically, to process about my own identity and ideas about destiny and life. So I tried to write about that. We write at home and make plans for the band at home, and we’re always together, and it’s really hard to turn off and go. It’s hard to actually remember what it was like before this, because we don’t have that separate [life], coming home from work at five o’clock and work is over. That has been a really hard thing to figure out, to find some kind of place where we can just be a normal relationship that’s not trying to become a working band. What is the dynamic like in your marriage when you’re writing such personal and intimate lyrics? Even though so much of what I write is about Patrick or inspired by shared experiences, there definitely will come a point where that’s too much, that’s ours, and I can’t say that. It’s almost to the point where because we have this relationship of complete trust and commitment, it almost works against us to where you can be angrier than you normally would be with someone, because that’s the person in your life who you can be mad around. Sometimes we have to remind ourselves that we have to dial it back and that’s hard. It’s something we get better at all the time. Patrick Carney of the Black Keys produced Young & Old. What was the relationship like with him? Was he influential in any ways other than music? Absolutely. First of all, it was amazing to defer to another person’s judgment on occasion when we would just be torn about something. It just felt so good to be able to look at Carney and be like, “You’re a genius. What should we do?” And he would know! But sometimes, he wouldn’t know, and he’d be like, “It needs to be something like this, and you have to make it happen.” He knew we were really trying to find our own voice and our own style and by forcing us to try things that seemed to be really counterintuitive — he would never make us use it if we didn’t want it — but he would make us try. It was exactly what we needed. What are your thoughts on women in music right now. I feel like women are being taken very seriously as artists, and not just vocalists, but songwriters and producers and instrumentalists, and I think it’s really, really amazing. On the other hand, one very weird thing I’ve been noticing in my very limited experience in the music industry is that women are a lot more critical of each other than men are. Because it’s a very competitive industry, women expect a lot out of each other. I feel like women have the feeling that there is only a finite amount of success to be had as a woman in the music industry, and there’s only so much room in the media for women to have a meaningful say, and they don’t want just anyone who’s undeserving to have that. To the point where women aren’t nearly as supportive and encouraging of each other as they should be, and I have experienced that a lot as I’ve met female musicians on the road. And also with female critics and writers, it might just be a complete fluke, but I have noticed a trend where some of our harshest reviews come from women — and it’s usually directed at me specifically. So in an ideal world, what would the response to this be? In an ideal world, this would just be irrelevant. No one would ever say there’s too many Grizzly Bears, there’s too many Fleet Foxes, but people say all the time that there’s one too many Dum Dum Girls, or Vivian Girls, or Warpaint, or whatever. And the weird thing is, men don’t really have that perspective anymore. I feel like it’s just women imposing it on themselves. Not to say that some men don’t contribute to this, but unfortunately, women hold themselves back more than anything.